The legendary Gold Star was a performance-orientated, all-alloy, single-cylinder machine produced in both 350cc and 500cc forms that became renowned as one of the fastest bikes of the ‘50s and as such a competition favourite both on and off-road. In 1937 Wal Handley lapped Brooklands at over 100mph on a BSA Empire Star and was awarded a ‘Gold Star’ pin in recognition. In response, BSA decided to produce its first ‘Gold Star’, based on an all-alloy, 496cc M24 single. A huge variety of popular successors followed and could be in trials, scrambles or road racing form and were produced up to 1963. Today it’s one of the most collectable of all BSAs. The lightweight, D-series Bantam is a simple, two-stroke, single-cylinder machine that was produced by BSA from 1948 (originally as a 125cc machine) up to 1971 (by which time it had grown to 175cc). Although often considered an archetypal ‘British’ machine it was actually based on the German DKW RT125, a design that was received by BSA as post-WWII war reparations. Even so, it proved hugely popular as an introductory or novice machine with estimates of up to 250,000 being sold. As a result it remains a popular – and cheap – ‘starter classic’ today. Air-cooled, 650 was BSA’s closest rival to the all-conquering Triumph and Norton twins of the late ‘50s and early ‘60s and was basically a development of the earlier, 40bhp A10 Road Rocket. Unfortunately, its pushrod-operated, overhead valve design couldn’t quite match either the speed of the Triumph engine, and particularly the twin-carb ‘Bonneville’ after 1959, nor the handling of Norton’s legendary ‘Featherbed’ frame. Even so, the BSA proved popular due to its reliability, good looks and value. Ultimate incarnation of the pre-unit (design with separate engine and gearbox) A10 twin was conceived to finally beat its Triumph and Norton rivals and was basically a ‘souped-up’ version of the Super Rocket twin cylinder engine but held in a modified version of the legendary Gold Star’s frame. A high compression head, new camshaft and Amal Monobloc carb raised power to 46bhp as standard (from 40bhp), rising to 50bhp with the optional race exhaust. Today it’s one of the most collectable BSAs of all with just 1584 built. Following its ‘pre-unit’, where the powertrain has a separate engine and gearbox, twins, which reached their zenith with the Rocket Gold Star, BSA introduced its new unit-construction twins from 1962-on in both 500cc (A50) and 650cc (A65) forms. The larger A65, in particular, despite not being able to match the performance of its Triumph rival, was hugely popular, came in a variety of forms and remained in production until BSA closed in 1972. Of these, the single-carbed Thunderbolt, twin carbed ‘Lightning’ and high-performance ‘Spitfire’ were the best. Last of BSA’s 250cc singles, the Starfire was a unit construction, air-cooled, OHV design, producing around 20bhp. Designed primarily for the US market where off-road lightweights had become hugely popular, it was essentially a dressed-up old design with a bigger carb, hotter cam and new, fashionable trailie styling (including a fiberglass tank). Even so, although decent, it was fairly slow compared to the likes of Suzuki’s new 250 Hustler and more expensive, too, so wasn’t a big success. Production ended in 1971. The 750cc triple produced alongside the very similar Triumph Trident was the last major motorcycle developed by the old, doomed Norton Villiers Triumph concern. Originally conceived as a Triumph and first developed as far back as 1962 by Bert Hopwood and Doug Hele, it was later decided to also offer a BSA version, which mostly differed by having a slanted engine (the Trident’s was mounted vertically) and twin loop cradle frame (the Trident’s was single loop). The Triumph sold better and, with BSA in more severe financial difficulties, Rocket III production ceased in 1972. Interestingly, John Bloor’s Triumph revived BSA’s Rocket III name for its heavyweight three-cylinder cruiser in 2004 so it’s unclear whether BSA still has any claim on it. One of the great ‘What ifs’ of British motorcycling. A high-performance, 349cc, DOHC twin it was one of the last attempts of the old, doomed British industry of the ‘60s and ‘70s at directly competing with the Japanese but, due to the collapse of the BSA group, never made it past prototype stage although they did have time to produce this ad. Designed by the legendary Edward Turner it produced a decent 35bhp, was capable of 110mph and used a frame developed from BSA’s racing triples, which were designed by Rob North. There were also plans for larger four and five cylinder versions which were hoped would save the company. By the time BSA collapsed just eight prototypes had been built of which two are known to survive at the London Motorcycle Museum in Greenford and the National Motorcycle Museum in Birmingham. Following the closure of BSA in 1973 and subsequent liquidation of NVT in 1978, a new company, ‘BSA Company’, bought the rights to the BSA name. Moving the company to Coventry, this much smaller concern initially produced a variety of small trail bikes, firstly with 50cc Morini engines (to produce the Beaver/Brigand) then Yamaha 125/175cc engines (for the Rambler/Tracker). 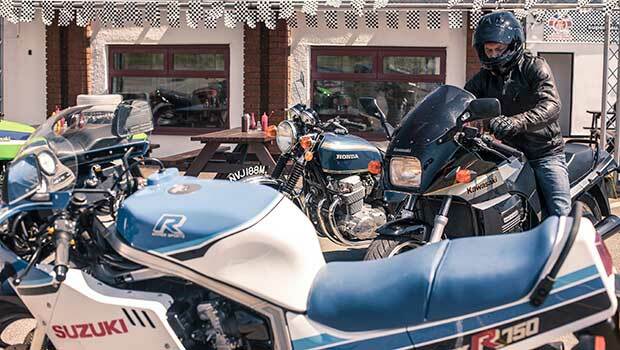 In 1991, BSA Company merged with Mike Jackson’s Norton International Ltd to form a new BSA Group which in turn was taken over in 1997 to become BSA Regal based in Southampton. A small batch of retro-styled, Yamaha SR400-powered ‘BSA Gold SRs were built by this concern, primarily for export to Japan. Since then, despite various suggestions including electric machines, little has been built. The giant Indian Mahindra Group, which also owns Peugeot motorcycles, bought the BSA rights in their entirety earlier this month. The world's fastest Triumph. Final preparations are underway.